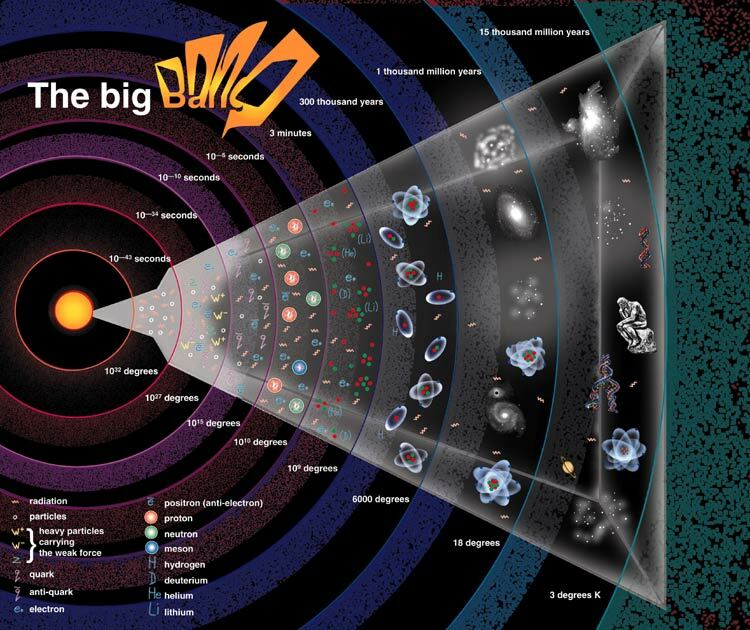 The Big Bang- with it originated space and time, 14 billion years ago. 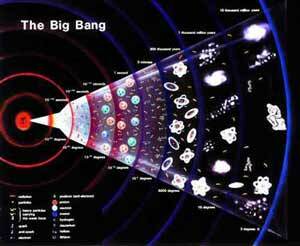 1) Big Bang: 10^-43 sec. : details unknown. 2) 10^-43 till 10^-33 sec. : origin particle soup, origin of matter, x-particles decay, plasma, quarks and antiquarks develop, more quarks than antiquarks remain. 4) 10^-6 till 10^-3 sec. : protons develop, quarks and antiquarks destroy each other, more quarks than antiquarks remain at last >> 3 quarks build a nukleus: a proton and a neutron. 5) 10^-3 till 100 sec. : it cools down to 1 billion degrees, neutrinos uncouple. Electrons and positrons destroy each other, photons are made. Radiation dominated era. 6) 100 seconds till 30 minutes: it cools down till under 900 million degrees, proton and neutron get together amount to deuterium. Energy is emitted as photons. Deuterium collides: >> so a nukleus of helium develops, all neutrons are captured during the synthesis of helium. 7) 30 minutes till 1 million years: atoms are developed: protons and nuklei of helium capture electrons and are electrically neutral. Radiation uncouples. (Before it neutrinos had uncoupled). 8) 1 billion years till 15 billion years matter contracts, galaxies, stars, planets and living beings develop: matter dominated era. ~ after 100 Trillion years: Stellar Era ends, in 10^37 years: Degenerate Era, in 10^38 years: Black Hole Era, in 10^100 years: Dark Era. The power of the human brain will probably change and rearrange the fate of the universe in such a way that we cannot imagine it at all. The spirit and intelligence will be such strong forces in the universe, that after the radiation-dominated era and the matter-dominated era we will speak about the spirit/ intelligence-dominated era. Intelligence will deal with the other strong forces of the universe in such a way, that the fate of the universe cannot be predicted today. Intelligence will have unthinkable possibilities to change the development of the universe, so that we cannot predict the end of life in universe any longer. Copyright Timelines.